This morning I was using my serger on a project. The serger is a mystery to me. When I use mine I often think to myself that whomever created this complicated piece of machinery must have been a genius. It finishes edges perfectly, trims while it stitches, makes perfect rolled hems a snap and is a life saver when it comes to knits. However, it is usually when I am threading it that I think about how complicated it really is. I lost my fancy tweezers when trying to thread the lower looper and was using facial tweezers. I find when I am frustrated I just need to walk away for a bit and come back. During this morning’s walk away I did some research and found out just who was the mastermind behind the serger. I found my information on Wikipedia, so we’ll take it with a grain of salt, but is still interesting. Overlock stitching was invented by the Merrow Machine Company in 1881. J. Makens Merrow and his son Joseph Merrow, who owned a knitting mill established in Connecticut in 1838, developed a number of technological advancements to be used in the mill’s operations. Merrow’s first patent was a machine for crochet stitching. Merrow still produces crochet machines based on this original model. This technology was a starting point for the development of the overlock machine, patented by Joseph Merrow in 1889. Unlike standard lockstitching, which uses a bobbin, overlock sewing machines utilize loopers to create thread loops for the needle to pass through, in a manner similar to crocheting. Merrow’s original three-thread overedge sewing machine is the forerunner of contemporary overlocking machines. Over time, the Merrow Machine Company pioneered the design of new machines to create a variety of overlock stitches, such as two, and four-thread machines, the one-thread butted seam, and the cutterless emblem edger. A landmark lawsuit between Wilcox & Gibbs and the Merrow Machine Company in 1905 established the ownership and rights to the early mechanical development of overlocking to the Merrow Machine Company. Throughout the early 19th Century the areas of Connecticut, USA and New York USA were the centers of textile manufacturing and machine production. Consequently many overlock machine companies established themselves in the Northeastern United States. In 1964 Juki Corporation was formed; a precursor of the modern industrial overlock sewing machine company. Throughout the 1980s Japanese and Chinese sewing machine production came to dominate the industry. In the United States the term “overlocker” has largely been replaced by “serger” but in other parts of the world (Australia, UK) the term “overlocker” is still in use. Joseph Millard Merrow (June 24, 1848 – March 27, 1947) was president of the Merrow Machine Company. Merrow was born in the community of Merrow, town of Mansfield in Connecticut. His parents were J. B. Merrow and Harriet Millard Merrow. He was educated at the Munson Mass Academy and Hartford Public High School. At the age of 15 he was employed as a pharmacist and a postmaster, appointed by Abraham Lincoln. Established in 1838, the family business was the manufacture of knit cotton goods; it was the first of its kind in the country. In 1888 the family’s mills were destroyed by fire related to an incident with gunpowder. J. B. Merrow held a patent on gunpowder. The destruction of the mill allowed the company to further develop a small shop that had previously supported the knitting mill, and the Merrow Mills thus became primarily a manufacturer of crochet sewing machines. Joseph Merrow was the driving force behind Merrow developing new technology, growing the new business and transforming it from a regional supplier of crochet sewing machines, to the market leader manufacturing hundreds of models of industrial overlock sewing machines. Under his leadership the company achieved a place of prominence in the industrial machine field with sales world-wide, hundreds of patents and the industries first industrial overlock sewing machine. Merrow was also active in politics. In 1880 he was elected to the House of Representatives of the General Assembly. He was founder and president of the Hartford County Manufacturers association. In addition he founded the Industrial Memorials Inc, a business group that devoted its time to commemorating pioneer manufacturers by funding and locating plaques and statues. He was president from 1939 until 1946. Merrow traveled the world, taking several dozen trips to europe and asia, while studying the industrial conditions of the countries he visited. Merrow never married, although his great nephews Owen and Charlie Merrow maintain his legacy as the current managers of the Merrow Sewing Machine Company. In the early 19th Century Mr. Joseph Makens Merrow became interested in the manufacture of gunpowder and established a powder mill 24 miles from Hartford Connecticut. When the Mill was destroyed by explosion in 1837 it was decided to build a knitting factory on the same site using water power from an adjacent river. At first the knitted goods were made largely of native wool which was sorted, scoured and dyed, picked, carded and spun into yarn and knitted into hosiery. The product was sold through commission merchants in New York and delivered to retail stores throughout New England by two-horse wagons. Following the gold rush of 1849 shipments of goods began to sail to San Francisco. As business increased, a small machine shop was started to support the equipment in the factory. In Conjunction with the knitting business, the first Crochet Machines were constructed for finishing around the tops of men’s socks in place of handwork. The Merrow machine as it is now known, was an invention of Mr. Joseph M. Merrow, who was president of the company until his death in 1947 at age 98. The Merrow Machines were constructed under his direction prior to 1876 with numerous patents granted. The machines were so useful that business was undertaken to introduce the equipment to other textile manufacturers. In 1887 the knitting mill was destroyed by fire and the company moved to Hartford and reorganized concentrating on the manufacture of overlock sewing machines. In Hartford the company focused on building lines of industrial overlock sewing machines that were used to overedge fabric, add decorative edging and support the fabric processing trade by joining fabrics. Between 1893 when the company was renamed the Merrow Machine Company, and 1932 when a line of “A Class” machines was introduced, Merrow had a significant impact on the textile industry. The technology and rate of innovation in this time, spearheaded by Joseph M. Merrow was unequaled in the industry. As a consequence there were several high profile legal confrontations, including Merrow v. Wilcox & Gibbs in 1897. Sales for overlock sewing machines were strong and Merrow grew to employ more than 500 people in Hartford Ct. The company also excelled developing international distribution and by 1905 had agents in 35 countries and printed manuals in at least 12 languages. In 1955, Merrow patented the Merrow MG-3U Emblem Machine. In the mid 1960s Merrow opened a manufacturing facility in Lavonia GA to reduce costs and maintain proximity to an American textile market that was moving from New York City to the American South East. In the 1990s Merrow developed a new overlock machine called the Delta Class, but was never able to gain traction with the new model. In 2004 shareholders of the Merrow Machine Co. agreed to a buyout of the company by Charlie Merrow, and it was renamed the Merrow Sewing Machine Company. After the reorganization in Massachusetts, the company released notice that it would continue supporting most models of sewing machines manufactured after 1925, and would re-release to market new versions of its most popular models. The company has capitalized on the trademarks “merrowed” and “merrowing”, working with manufacturers who use Merrow Machines to brand and market “merrow” stitching. In 2008 Merrow developed a social network for stitching named merrowing.com, and introduced series of rich media web-based tools to help people research and understand the myriad of stitches produced by Merrow Machines. The Merrow Machine Company is now based in Fall River, Massachusetts, and is managed by Charlie Merrow and Owen Merrow great great nephews of Joseph M. Merrow. The company continues to build many models of overlock sewing machines. In addition to being one of the most recognized brands of textile equipment in the world, it remains the oldest manufacturer of sewing machines still made in the United States. Well, I’m feeling refreshed and ready to get back to that lower looper. Who knew the serger had such a rich history? I did visit the Merrow Company web site. It was a bit complicated to navigate, but it appears they are not targeting sewing hobbyists such as myself. They did have pictures of some of their stitches, and they are very nice. I think it is fantastic that the technology developed so long ago is now available to sewists like myself at an affordable price like my Janome. Sure, I’d like to upgrade to the great ones that thread themselves at some point, but to try it out in my home I took a low-end model. I use my segrer quite a bit and now when I am using it I can think of Joseph Merrow and the innovations he made with fondness. 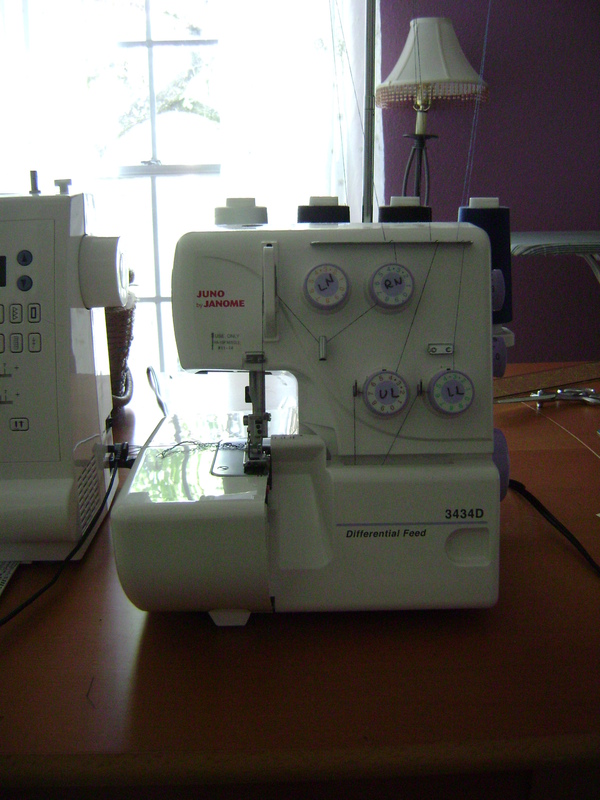 This entry was posted in Serger FYI, Sergers and tagged serger history on April 6, 2012 by staciethinks. Very interesting! I wouldn’t have guessed that the serger dates back to the 1800s. Joseph Merrow was quite a guy. I was surprised it went back that far as well! I was surprised to hear that sergers had been invented that long ago. I saved my pennies and nickels, and got my first one in 1985, a White 3/4 thread. My girls were little then, and I made most of their clothes. What a fabulous development for home sewers! I am in fact thankful to the holder of this web page who has shared this impressive article at at this time. So it becomes very important to understand how to behave after your have you ex back after a breakup. could be far more compatible with. longer than harder. This is Glen, Carolann’s bodybuilding and exercise husband. body parts can handle the stress you will place under the routine. to do and what to say to get your ex-lover back in your arms. You want her to believe you got a grip on the situation. very emotional level, unlike any apology you have ever witnessed. Dark grapes, blackberry, blueberries, black currant, plum, tarragon. your food excess by calculating how many more insulin units must pumped into your blood stream. This helps you avoid over eating and eating junk food. as a finest web site for hottest updates. want to suggest you some interesting things or tips. Perhaps you could write next articles referring to this article. going through a relationship problem is “How can I convince him to stay with me. If you are to spring for an electric, don’t buy the cheapest one you can find. solutions for the above could help with the design of better pharmaceutical products that are able to target specifically genetic mutations in each individual. myself personally spending a significant amount of time both reading and commenting. I am regular visitor, how are you everybody? This paragraph posted at this site is genuinely good. with your RSS. I don’t understand why I cannot subscribe to it. Is there anybody having the same RSS problems? Anyone that knows the solution will you kindly respond? For those who are going to buy a new serger, they should read this post, I’m sure it will be helpful to them. Very well written. Admirable concise and factual style. But, at the risk of being pedantic, that should be “industry’s first industrial”, not “industries first industrial”.